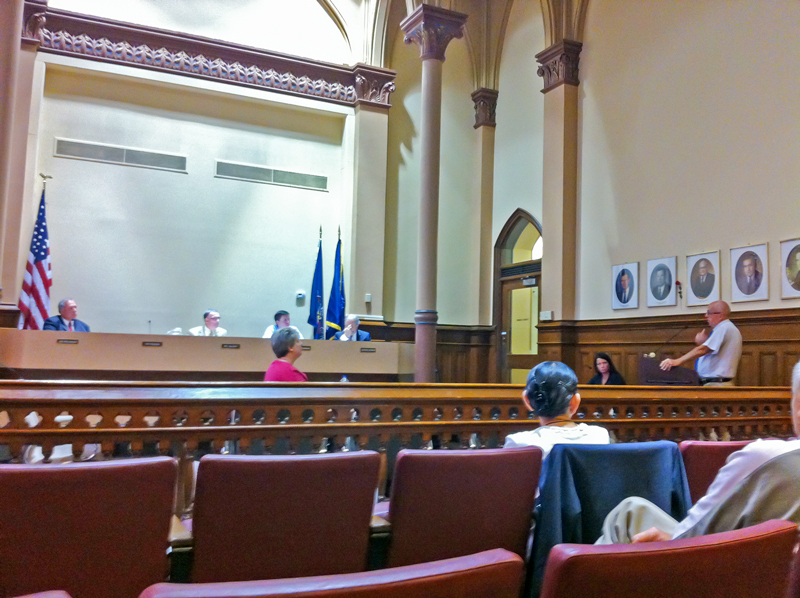 Attendees of the June 25 Scranton City Council meeting heard from residents Doug Miller, Lee Morgan, Ozzie Quinn, Marie Schumacher, David Dobson, and others. The topics of discussion at the evening’s meeting were free swimming, the economic state of the city, council and mayoral leadership, the double pension issue, and Scranton pools. Scranton resident Doug Miller explained that he was not going to “paint a rosy picture” and deceive people into thinking the city is headed in the right direction. In his eyes, the city keeps taking steps back. Miller believes that in order to turn the city around, its residents need leadership. He indicated that that starts at the top and trickles down. He said that he found it hard to believe no one knew about the “double pension” issue, and felt that most of the “people seated in these [council] positions” have what it takes to fix the city. He said the city couldn’t tackle the pension problem because it was way above the “people seated in this council.” Miller did indicate that it was the “majority,” but not all of council that he was speaking to. He addressed Scranton resident, and regular council meeting attendee, Marie Schumacher, stating that he felt for her because she constantly comes with questions and has a hard time getting them answered. He feels that the reason it is so hard to obtain responses from council is that they do not posses the answers. He asked “what was the point” of bringing Mayor Courtright and financial advisor Henry Amoroso to a future meeting, as council has repeatedly stated they would do to bring more answers to residents. Miller feels that because of a lack of leadership, the community has become a “laughing stock,” as he regaled how people laugh when he tells someone he is from Scranton. He said Scranton has been embarassed not only locally, and in the community, but nationally. He indicates that the city has a lot of big challenges, but so do other cities, and they overcome them at some point. unions to get elected. He emphasized that residents need a “legitimate government.” Morgan agreed that Scranton pensions should be sent to the state, but he lamented that the state could’t do it because they have their own pension problems. Ozzie Quinn said he chose to start a Hill Section fund-raiser that asks people to give $10 towards free swimming for Hill Section kids. He said that last year they raised enough. Quinn hopes to get low-income kids to swim at no cost to them. Marie Schumacher said she hopes the mall hasn’t been procured by a nonprofit. She asked “do we have revised list of streets to be paved with liquid fuels money?” Councilman Gaughan affirmed that they did, but sad it was not finalized when she asked to have a copy. She said the fire department’s overtime is not right. Schumacher said she filed a Right-to-Know request to obtain the information, but it showed that a lot of fire fighters have retired, with five already gone and two more this pay period. She asked “why aren’t we replacing them?” She stated that she guessed that’s why there is overtime. Councilman Wechsler said he will address that later that night. Schumacher expressed her dissapointment with Novembrino pool, and said that the city sunk a lot of money into the pools. She inquired if anything was being done with them. Councilman McGoff said that “as far as I know, nothing is being done.” He said there was a plan, but it fell through, and he hasn’t heard anything else. Schumacher asked if DPW would know if they are at least putting water in the pool. Councilman McGoff said that they wouldn’t know that either, because there were no plans. She called the response “sad” because the taxpayers put so much money into the pools, and they’re left to detieriate. Schumacher said she hoped council was passing something that would affirm that the position of the council was that the double portion of pension goes away immediately. Dave Dobson asked residents to call Congress and the U.S. Senate to find out how they voted on the TPP, and tell them that if so, they will “primary them.” He also gave out the number to call the White House. Dobson called on council to say “no” to any more sub loans or grants. He advised letting private entities and the free market stand on their own. He again told council that there was no responsible way to monetize the sewer plant. Councilman Wechsler said that the meeting with the auditor general was “eye opening.” He stated that “abuse of authority should be punished.” He said that it would be too difficult to deal with the money that was already paid out, that the city should correct the problem going forward. Wechsler said that the city council was doing a lot of things going forward. He said that public raises were delayed until the pension fund is healthy again, that uniformed bargaining unions need to contribute more to pension, and that future plans should consist of hybrid plans. Wechsler agrees with what the mayor wrote about the Scranton pension plans being taken over by the state. He said that tactic brings professional management in, and removes pressure from those on the pension board. He said he was surprised the mall garnered a $5.2 million bid and that he hopes the new mall owner(s) will make use of it as retail and housing or retail and offices. He addressed Marie Schumacher’s concern about police and fireman overtime, and said that focusing on overtime did not provide the full picture. Wechsler said there were 128 last year, and now 108, which he addressed as a $131,000 savings. He spoke to the mayor about hiring more firemen, and said that if the city gets a certain grant, it could hire eleven more. Wechsler said that the police deptartment’s 2014–2015 overtime is up because 13 officers are off because of heart and lung issues. Councilman Evans opened his segment thanking Auditor General Eugene Depasquale, who he said was one of few people pushing for pension reform. He called Scranton’s problems “systemic and cultural,” but added that they have much more work to do. Evans stated that he “fully supports” the state taking over Scranton’s pension system. As he said he was viewing the mall sale and feeling nostalgic, he wondered if Scranton didn’t have a 37% mercantile tax, “what would city look like?” Evans said it chases middle-class residents from the city, and that the potential 58 percent or more raises in property taxes are making things even worse. Any increase in taxes will ultimately net less revenue. He said the city is not going to change course or completely change direction overnight. He feels they can do a better job of listening on Thursday nights. He proposed having “idea sessions,” for getting the city out of its economic slump, with stakeholders, businesses, real estate agents, communities, the “creative class,” and other residents. He feels the city can find great ideas from the residents, and called Scranton a smart and dedicated city. Evans advised the city to step back, listen, and learn. He said he would ask his colleagues to come on board with his idea. Councilman Gaughan expressed his concern about the double pension problem and said the issue has caused a “complete and utter divide” all while costing a lot of money. Gaughan stated that it also cost the trust and support of people, which he viewed as being much worse. He said he planned to work to restore the trust and faith of Scranton residents. He said “everywhere I go, I hear about it.” Gaughan agrees with Evans, and feels the idea of reaching out to residents was a good idea to follow. He said many in the city have “bold, new ideas.” He mentioned that the Comcast store in the mall is moving to 1128 Commerce Blvd and becoming an Xfinity store. He said Comcast customers do not need to go to that location specifically, as they can go into certain Weiss stores, Riccardos, and others to pay their bills. He addressed Dave Dobson’s concern about paying for steps in East Mountain by stating that cinder block steps were put in prior, and needed to be replaced. He wants to resend a letter about police and fire contracts. Gaughan wants to ask if an actuarial study has been done because he said one was performed during the double pension debacle, but it was after those people who received the money retired. Councilman Mcgoff brought up a discussion council had at the Pennsylvania Economy League (PEL) meeting. The discussion centered around utilizing a payroll tax, as was part of Scranton’s recovery plan. He said it was revenue neutral, and would do away with the mercantile tax. He said Scranton is planning an LED switchover, and stated that operational savings would pay for the cost of implementation. McGoff said that, originally, it was just going to be the downtown, but now will be utilized elsewhere in the city. He said the council will ask whether they can receive regular updates about the preparation of the city’s audit by Mulraney and Mulraney. McGoff said that what the auditor general told them in their meeting was nothing the council didn’t already know. He complained that there were no criminal actions included or assignment of culpability to anyone for approving the double pension payout. He pointed out that council possessed no culpability. Councilman Rogan was not in attendance for this meeting. All motions were passed unanimously. For a listing of the motions on tonight’s agenda, go here.